Where did his deep empathetic and ethical approach come from? How does he perceive a horse? What does he pay attention to before he even starts working with a new horse? Feel – what is it for him and how to improve it? How to find a way to achieve a unity with a horse? What to do to become a better rider? 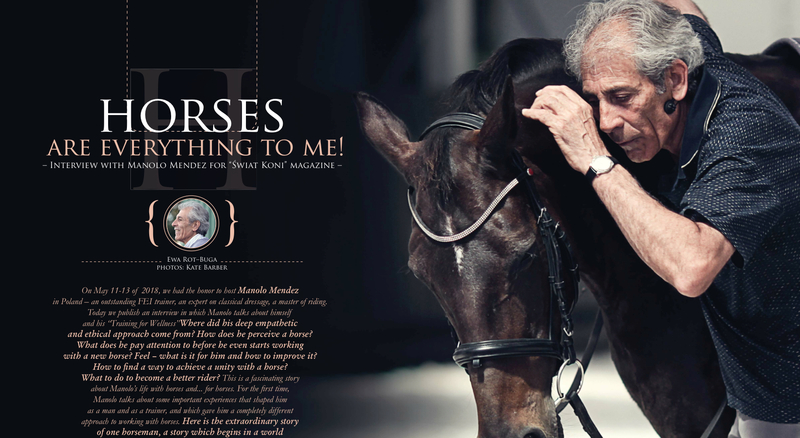 This is a fascinating story about Manolo’s life with horses and… for horses. 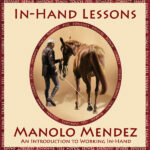 For the first time, Manolo talks about some important experiences that shaped him as a man and as a trainer, and which gave him a completely different approach to working with horses. Here is the extraordinary story of one horseman, a story which begins in a world where working with horses was as familiar to men as breathing. I am not going to ask you how to teach piaffe or levade, or how to lead a horse to the GP level. There are many books about it and many trainers who can teach this. Mastery is not the same as the number of horses trained to the GP level. To me, mastery is more than having technical skills in working in hand or riding even. I would like to touch on what distinguishes the way you work with horses from the techniques of other trainers. During the clinic in Sopot in Poland, many beautiful words came out of your mouth that show you are treating the horse in a really special way. Let me ask you about the hidden dimension of the mastery! At the beginning, tell me, please, how did your start your adventure with horses? I was born in rural Andalusia in the fifties. My family farmed and was of modest means and our horses allowed us to work the land, and drive the grain to town, allowed us to manage our sheep and cattle and take them to market. A horse took my mother to the hospital 25 kilometers away two days before I was born, and it is on the back of a horse that she returned with me, in her arms, two days later. It is also on the back of a horse that my mother lost my little sister who was very ill as she was taking her to the doctor. When I say we depended on horses for our lives, I mean this very literally. Horses were a part of our daily lives in so many ways, I cannot count. We farmed with them, herded cattle, travelled far and wide, took our women in their finest dresses and lace mantillas to the Feria on their backs, and competed against one another in a multitudes of games designed to showcase our horses skills and beauty. When we passed, they pulled the coche funebre, the hearse that took us to our grave. I learned to walk holding on to the harness of the large, patient horses who pulled the plow and then the combine harvester through our wheat fields. I wrapped my fingers in their manes and fell asleep on their wide, sun-warmed backs. Horses were as breath to us. It was a very different world back then. What shaped you most as a rider and trainer? I have never had lessons in the sense of being in an arena with an instructor telling me what to do because that is not how you learn to ride and work horses on a farm. I had an example every day as a child, and that was my mother, Maria de las Nieves who was a rider of some renown in our community and who did shows at local fairs. My mother was a beautiful and kind rider, I carry her example with me to this day. Well, I did have one riding lesson when I was 8 years old with a retired cavalry officer. He wanted me to hit my horse in the belly to cinch the girth and I refused. I cried so much, I never had to go back. Any special events or experiences or maybe coaching personalities? I owe my life to a horse. When I was a very young child, the plain flooded and the river rose so fast and high the bridge disappeared. My mother put my brother and I on the back of one of our horses and asked him to swim to the other shore – my mother swam behind him, holding on to his tail. I held on by a fistful of mane as the water covered the horse’s body and my legs and seat. It was chaos, water rising fast, current strong, the river angry and lashing at us but this horse kept swimming even when the water was covering its croup and neck and only its head, stretched out towards the shore, was above water. This horse did not panic or try to get rid of us but swam us to safety. I will never forget. One horseman who influenced my life is Don Alvaro Domecq Romero Sr. Don Don Alvaro Domecq Romero Sr. was a brilliant horseman, showman and a versatile rider. He was an inspiration to me and I owe him a lot as he hired me to work at his magnificent training stables when I was 14 and took a special interest in me after watching me ride. I learned from him how to ride different breeds and disciplines. He gave me the opportunity of a lifetime and I am forever grateful to him. He was and remains one of Spain’s most influential riders. When at age 18 I became second in command of the Real Escuela Andaluz del Arte Ecuestre (after director Don Domecq), and was at that point a “level 3” rider training horses to Haute Ecole together with Don Domecq, some great riders such as Filipe Graciosa, Guillermo Borba, Francisco Cancella d’Abreu, Reiner Klimke and Nuno Oliveira were frequent visitors to the School and we rode alongside one another and learned from each other. You work with horses with great empathy and sensitivity. A horse – what is for you? How do you perceive horses? Growing up in Spain during Franco, I lived with fear as a constant companion. Fear of the unknown, fear of violence. My parents told me that in the night, trucks would come and take men but also women and even young people who dared speak against Franco and his regime. In the morning, they would be found dead. This happened in my village but it was happening all over Spain. It created a climate of fear and a need to be careful, to learn to be quiet and observe so as to not make a mistake and say or do the wrong thing that could cause someone great harm. This state of having to constantly be careful, of living with a degree of fear of being punished is something I believe very many horses experience and perhaps because I experienced it too, I connect with them as I do. I know in my body, mind and spirit how this kind of chronic worry feels and changes how you behave, feel and think. I also know in my body, mind and spirit how important feeling safe, being around people who are gentle and can be trusted is to be able to function and learn. This is something that is not very easy to talk about but when I was a young child, I would take cattle or sheep to the market to sell with my uncle. The market was far and we would camp in the open country under the night sky with the sheep or cattle and horses and it felt good to be on this adventure with my uncle watching over me. But, when the cattle or sheep was sold, sometimes my uncle, who was a good man, but a man who drank and gambled, would tell me to wait for him with the horses. And he would leave me alone for a day, two days, even four days alone. I was a young boy of maybe 8-10 years old and this was frightening to me. I had to learn to wait and sit alone without knowing what would happen to me next. I could not trust my uncle’s promises because he did not keep them. And so I waited and worried. And because we were so many children and we had little money and my Mother worked very hard, I did not complain when I went home. Waiting with the horses for company gave me some comfort and tightened my bond with them. Waiting alone with them also helped me understand as I grew up and started to train what it is like to be a horse. How little to no choice horses have about how they live and how they are trained and how important it is to let the horse know what I want and to be consistent and patient and kind so the horse does not have to worry, does not have to exist in a state of perpetual concern about what is coming next and he can learn to become calm and confident because he can trust me to be consistent and fair. To me, horses are everything and I find them easier to understand than people. Horses are the manifestation of God to me, and they are his most generous gift to mankind with our friend the dog. These are small but significant experiences that shaped my feelings about horses and about training. What do you pay attention when you start to working with a new horse? I like to look at and listen to the horse before I do anything with him or her or start teach the rider. I look at the horses’s eyes, face, body, posture and I listen to his/her breathing and to their rhythm when in movement. I pay attention to tack fit and feet and to how the horses move on different lines at different gait. I pay attention to how they move their spine, their neck and head and tail. I also like to touch horses and let my hand tell me if there are any restrictions and pain in their bodies – this is a way to confirm what my eyes tell me but also let the horse know I see him and I will treat him and train him in a respectful manner that will make him feel better or good. I also want to know the horse’s history. Has it had problems or an incident that would leave it mistrustful of people and resistant or defensive? If the horse does not like me at the start of his training, I spend time to be a friend. Only when the horse’s trust is established will it work in a positive way, relaxed in body and mind. I only take the next step when the previous one is solid and the horse is physically and mentally comfortable with the work. Then, and only then do I ask for more. If the horse becomes confused, I do not add to his confusion, instead I take a full step or half step back and allow the horse to re-establish his confidence and balance before progressing to the next step. When we look at you during clinics, everything seems so simple. We do not see you might be tired or impatient. I do get tired and impatient sometimes because I am human but my experience as taught me that only when I make things very simple for the horse and take the time it takes to train does the horse learn and develop in a beautiful way I can be proud of without getting afraid, tense or upset. So, when I get tired or impatient, I go water my flowers and trees or build sheds or cut hedges and give myself the day or week as needed because sometimes getting tired or impatient has nothing to do with the horse and everything to do with life. Just as sometimes, a horse needs to have an extra day off, or a trail ride or just a quick lunge and then back to the paddock. We are not machines. What is the most difficult for you in your coaching work? What is difficult in coaching is seeing lovely people who love their horses and often spend a lot of money to make sure they are doing the right thing and yet they have been given poor training and care/management advice and their horses are in pain. Also, I found it very hard to work with riders who place their competitive goals ahead of their horses wellbeing and welfare and want me to teach their horses piaffe and passage as a trick instead of working together on developing the horse’s strength, suppleness, straightness, balance, regularity, and collection. What are the most common mistakes in horse training? 1. Riders who have not been taught how to ride on a circle or any bended line and do not give enough room to the horse on the outside rein to be able to accommodate the outside of the horse lengthening as it bends. 2. Riders who have not been taught to have a following contact and keep their hands still or pull backwards towards their mid section, especially in walk and canter. 3. Riders who have not been taught to ride with even contact and cause their horses to develop a permanent head tilt. 4. Riders who have not been taught to have an independent seat and whose hands are unsteady and catch the horse in the mouth constantly or pull. 5. Riders who have not been taught legs no hands, hands no legs and for example ask for canter while pulling back. These mistakes are ones that until resolved means the rider has a flawed foundation from which to develop their horse. The rider who has not addressed these mistakes will be directly responsible for making their horse more stiff, more crooked, more unhappy, more likely to become unsound and develop training vices. If you were to point out the three most important things for a rider, what would it be? Find a horse that is a good match for you. The right horse can make a timid rider confident and a confident rider kind. But the wrong horse can make a rider terrified or impatient, etc. Spend time alone with your horse in the stables and in the arena. Your horse is your partner and as you teach him, he teaches you. Take a lesson and then take the time to practice and think and experiment and listen and analyze and work TOGETHER with your horse on your own even if it just walking and FEELING your horse’s movement without the pressure of having to do something. Be worthy of your horse. Too often these days, a rider’s relationship with their horse is managed by a trainer. The rider is encouraged to be a tourist at the barn instead of learning to become a horseman/woman and study every aspect of horse care, management and training. It creates a distance between a rider and his/her horse. Why should a horse that does not know you, trust you? And if you are uneducated and do not understand your horse, why should he trust you? There are many riders who want to ride well, but they are limited by their own body or mind. For example, they do not want to get upset, but they get nervous. They do not want to pull, but they pull. What do you advise in such cases? Do you have any suggestions how to work on yourself in such cases to become a better rider? You can only become a better rider by…riding. However, it helps to ride a horse that is a good fit to your level and mindset as discussed above. And it helps to find an instructor that understands basics and can teach you without bullying you. If you pull, than be kind to your horse and switch to a sidepull bridle so you do not destroy your horse’s sensitive mouth and cause him pain. A feel – what is it for you, what do you mean by ‘feel’? Feel is the ability to OBSERVE and LISTEN to the horse with your mind, body and spirit and ANALYZE and RESPOND to what he is telling you through his eyes, body, posture, behavior, the movement under your seat, the reins in your hands, the breath between your legs. How he responds to your presence, your touch, coming to the arena, having to work, etc. It touches on every aspects of being with horses, not just riding. During the training, when you were working with one grey mare, you said you want to make the mare work in meditation. What did you mean exactly? Did you want this state only for a horse or a rider? This mare was over stimulated by the clinic environment on day 1 and was finding it impossible to keep her mind with her body and in the arena with her rider. She was breathing shallow and her mind was clouded. When she began to calm and move rhythmically, she loosened up and was able to breath better which fed oxygen to her brain and muscles and helped her regain her ability to listen, focus and learn. This state of quiet awareness where the horse is feeling good and sheds his worries as he breathes deeply is what I call a meditative state and it is something that all horses and riders should aspire to. How to achieve it? How can we realize that we are going in the right direction? This state is very much about the horse’s ability to breathe deeply and rhythmically and not having his diaphragm muscles tense and blocking the breath. The first thing to encourage this good breathing is to ask the horse to move in his right rhythm, with the right tempo. Not too fast, and not too slow. Too often horses are ridden over tempo which makes their bodies stiff and their minds worried. The second thing is to ride around the arena and keep figures and transitions to a minimum. Allow the horse to find his rhythm and stay with it. Let the body’s regular and uncomplicated movement help quiet the horse’s mind. And of course, do not strangle the horse with overtight girths and bridles. Sometimes you say a horse is “worried”, or “he feels like no one wants him”. How do you know that? How do you feel it? Perhaps because I have worked with many thousands of horses and paid attention to each one, I have come to recognize very small clues a horse may give about how he or she feels. Often horses are only evaluated in terms of their performance and bodies with little attention paid to WHO they are. We hear that horses are only interested in two things: eating and avoiding being eaten. It is surprising how many people who have horses believe hat horses are very limited and have a brain the size of a walnut. Well, the horse has a much bigger brain than that and the horse has many, many emotions. The horse is social and hedonistic and some even have a sense of humor. They are very emotional creatures that are sensitive and try very hard to please us and connect with us. I see each horse as an individual “person” and maybe they show me a little of themselves more because of it. You also said that horses communicate telepathically. What does it mean? With other horses? With people? What you say is really fascinating and I have the feeling that we are touching a completely different dimension of communication with a horse than that is available to riders. Tell us more about it, please. I was riding horses in my mother’s womb and I have never questioned these feelings until the time I was asked to put words on what I experience. It is not easy and maybe with time as I think about it I will be able to become clearer about it. Have you ever ridden a good canter with your horse where you felt completely in tune with him/her and the world outside, the sounds around you, disappeared as everything became a blur and it felt like all that existed was just you and your horse? Have you ever experienced these moments where you felt as though you had fused into one new creature with six legs and your horse was not just carrying you but transporting your spirit to another place entirely? That is the healing energy of the horse which is a very special medicine for mankind. It heals wounds of the spirit and of the body. In this common elevated state the horse and riders’s hearts, minds and spirits can meld in such a way that you can just think and your horse responds. This healing energy does not flow only from the horse to the rider. As we receive from the horse, we can also be mindful and deliberately offer healing to the troubled, fearful, tired horse by guiding him towards this meditative state when he has lost his way. We can offer this healing connection. Horses are herd animals who form deep bonds with their families and friends. They know how to live in symbiosis with other horses and they fear aloneness, so when we offer healing through togetherness that is gentle and easy, the horse welcomes it and us. Good breathing and right rhythm are two pathways to opening the door to this connection. But good breathing and right rhythm are not the key to creating this invisible communication channel. The key is the HEART. We must come to the horse with a sympathetic, gentle, understanding heart. A heart that wants to help the horse, to assist him. We have to allow ourselves to feel the emotions that arise when we ride but also massage, work in-hand or stand with our horses and be able to respond with empathy and kindness to what we sense the horse is feeling. Sometimes we may be filled with peace and happiness but sometimes a horse may cause us to become emotional and cry because we can sense how painful or miserable or sad a horse is and when that happens we have to look at how we can help this horse feel better with all the care/management, training, veterinary, wellness techniques we know but also and as importantly with our heart energy. Without an awake, open heart, we can live next to our horses a lifetime and never know them – they will know us, because they are horses, but after a while, they will shut down their efforts to connect because they know we do not see them fully. It is a self-protective measure for them to shut down rather than keep trying to connect with us and be as one when they know that their attempts will be rebuffed or ignored. To find that place of stillness in your heart when the connection is made, is like no other and it gives a sense of peace, of coming home and of faith because it feels so right. You have so many different experiences with horses, you could certainly teach only high-class players, but you teach all riders, and your system is called “Training for wellness”. Why? I do teach some top level riders in Australia but I found that if I wanted my knowledge shared to benefit amateurs – which are the majority of riders – I had to teach all levels. When I do clinics, I am grateful when we have a mix of green to FEI horses because I can demonstrate how the same training approach benefits the horses at every level of training. I call my approach “Training for Wellness” because when we train, there is no neutral steps. We are either taking a step towards a sounder, fitter, stronger, more balanced, supple, straight, happy horse – or not. Over almost fifty years, I have integrated in-hand work, bodywork and riding with one view in mind: to train healthier, happier horses or rehab damaged horses so they can regain some quality of life. Why did you choose a coaching career, not a competitive one? My passion has always been training. Meeting with my horses every morning and deciding what the work will be. I often do not know what today’s ride will be about until I have had a chance to see how my horses feel mentally and physically. I love that freedom. I love taking my time. I love not having strict goals and timelines and not having to rush or compromise in anyway. I like being able to go water my tomatoes one day if my mind is not on riding. This is a freedom that is not compatible with competing and with time I have learned to accept this about myself. I do enjoy participating in educational events like Equitana with my horses and doing exhibitions because….I can adapt the work to the situation and change figures, movements and more…this freedom is just not possible in a test arena. It can be noticed that the equestrian environment is divided not only because of disciplines, but also in some sense of thinking of horses. Thera so many ways that suggests how to work with horses technically – is there a group you prefer? This is what I have observed: There are good riders and bad riders in all groups. There are good riders in competition dressage and bad riders in classical dressage so we have to be careful to apply labels and think that all competition riders hyperflex and LDR their horses and all classical riders have healthy, happy horses. I judge a rider by their horse. How comfortable and happy it is and that is it. What do dressage competitors appreciate when working with you? I am considered a piaffe, passage and pirouette expert but I hope that by now what dressage competitors appreciate is my helping them make their horses more beautiful by helping them ride in a manner that supports and encourage their horses so they can do their best work. This means developing a horse that is calm, keen, attentive, confident and loose, supple and flexible (per article 401 of the dressage guidelines) via exercises and figures ridden with tact and sensitivity. I think dressage judges are individuals and some will recognize and appreciate that in my training, I adhere to Article 401 of the FEI Dressage Guidelines which define the object and general principles of dressage. How does the day in the life of Manolo Mendez in Australia look like? When at home outside Melbourne, Australia, I teach a few days a week and I do a couple of clinics around Australia every month. At the moment there are seven horses including 4 stallions at La Mancha, my farm, which range from a just started 4 1/2 year old to a horse schooling GP movement. I work with them 6 days a week though not every horse every day. I have two young working students who help me and whom I teach. On Mondays, I rest. We often have visitors at La Mancha which makes for many good discussions often around a cup of coffee in the arena lounge after the horses have been worked. I like being on my farm with Kate and my wonderful little dog Gizmo, I like gardening and building and repairing things. There is always something to do on a farm. When we can, we visit with our children and grand children and spend time with family. It is a simple life really, but one I appreciate very much. Do you like Poland? What do you like in Poland best? Do you like coming to Poland? Yes, I do like Poland, especially the riders that I taught. My Polish students are very enthusiastic and open-minded and are a pleasure for me to teach. I also found the auditors to be a very good group of people. Very sunny and engaging. So many young people who want to do right by their horses, it makes me feel hopeful for the future. I have to thank Martyna Paczos and Agnieszka Kowalska of the Classical Way for their excellent – better than excellent – organization and success in bringing such good people together. Is there anything you would like to tell Polish riders now? Please, tell us. The riders all did very well and made good progress during the clinic which each one of them can be proud of. It is not easy to ride in front of over 200 people with a trainer you do not know! So, keep working on the things we did in the clinic and when I see you again next year, you can show me your work. I look very much forward to seeing you again. ACKNOWLEDGE YOUR HORSE: Recognize the unique spirit, personality and history of each individual horse. ASSESS YOUR HORSE & ADAPT THE TRAINING: Let go of your expectations, ride the horse you have today. ASSIST DONT INSIST: Do not drill and demand what the horse cannot give you, instead be a benevolent and kind teacher and show him the way. ASK DO NOT TELL: Harmonious partnership is based on open and respectful communication not on forcing the horse to comply using force. ACCEPT & APPRECIATE: BE AWARE and grateful for every little try you horse make. Let your horse leave the arena feeling encouraged so he may come back in ready to try again tomorrow.